Hey Everyone, This week we are featuring one of our sweetest morning baristas. Angie is a fantastic barista, along with having some of the best pipes we’ve ever heard. 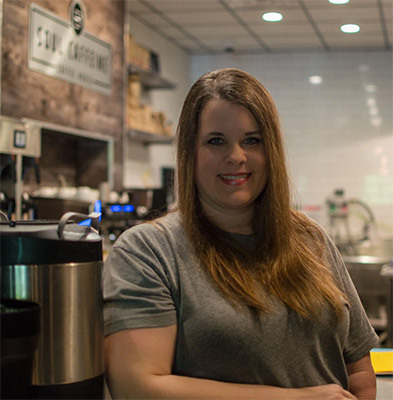 She works part-time as our barista, works full-time as a mom, and performs each Sunday on the worship team at Daphne United Methodist Church and leads worship at V60 Community Church, here at Soul Caffeine! You guys definitely need to check out one of her worship services to hear her amazing voice and feel her passion for Jesus. She is an outstanding example of kindness and compassion, along with some serious determination. Angie joined our team just a little over a year ago and has since become an essential part. When she began she didn’t like coffee of any kind, so if you’re not a huge coffee fan, she can definitely direct you to some of our coffee-free favorites!